Only one out of every six water bottles ends up in the recycling bin, the rest are sent to landfills or contribute to devastating ocean pollution. You can help lessen the burden on the planet and save marine and land animals by recycling, reusing and reducing your overall consumption of plastic. 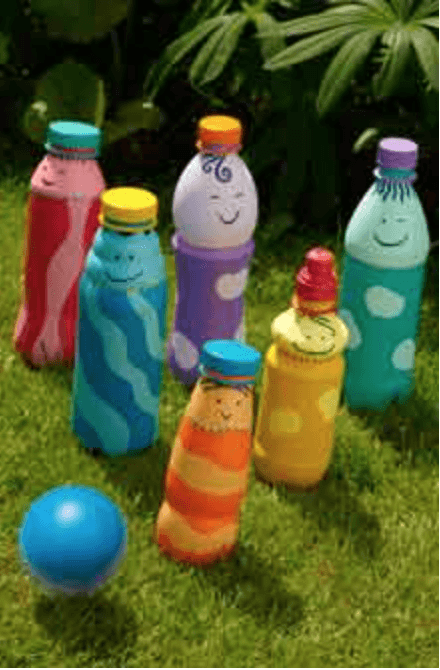 Here are the best of the best plastic bottle craft ideas for kids of all ages. We have split up the list into 3 categories: easy, moderately difficult and most challenging. We promise you don’t need an advanced degree in crafting to accomplish any of the awesome ideas you see on this list. These projects require few materials besides plastic bottles and minimal help from adults, all while offering a whole lot of fun. Teaching kids the power of saving money just got a lot more fun! All you need is an empty plastic milk bottle, scissors, scrap paper and a permanent marker. This spooky craft is ideal for Halloween! 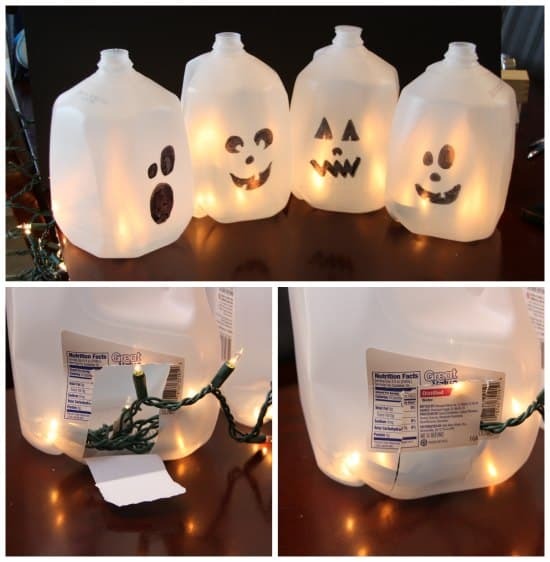 All you need are decorative mini lights, empty milk jugs, rocks, a pencil, knife and sharpie marker. Believe it or not these glam flowers were once basic plastic water bottles. The end result looks great and even preschoolers can tackle this easy art project with a little assistance. Get your kids outdoors blowing giant bubbles with this awesome and easy art project that’ll keep them busy for hours. 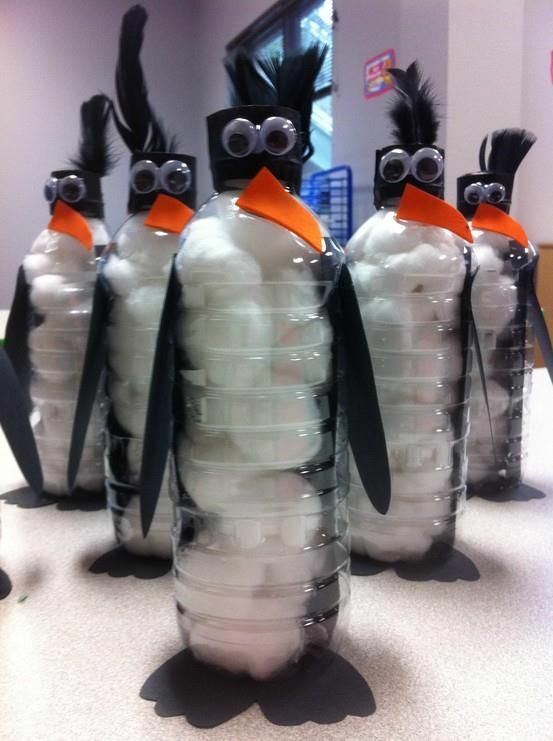 Penguins are off-limits when it comes to pets, but this DIY recycled bottle activity allows your kids to create the impossible. All you need are a few basic art supplies paired with cotton balls and a recycled bottle. Instead of going out and buying more toys, have your child make a toy they will enjoy playing with for hours. By simply attaching a pom pom or wiffle ball to a pre-cut milk jug your child can practice tossing and catching for hours. Have you ever noticed that the bottom of a soda bottle is similar in shape to a pretty flower? 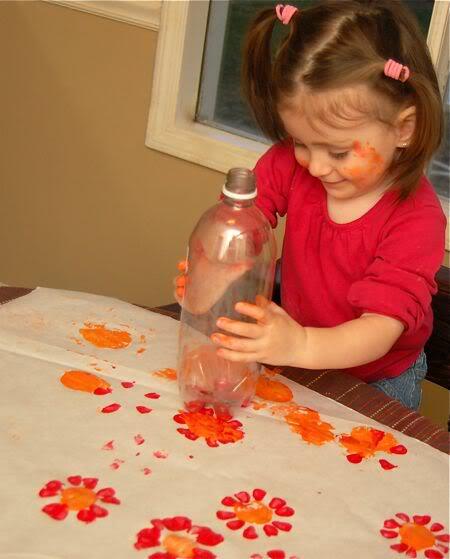 Adding paint to the bottom of a soda bottle makes the perfect flower power stencil. 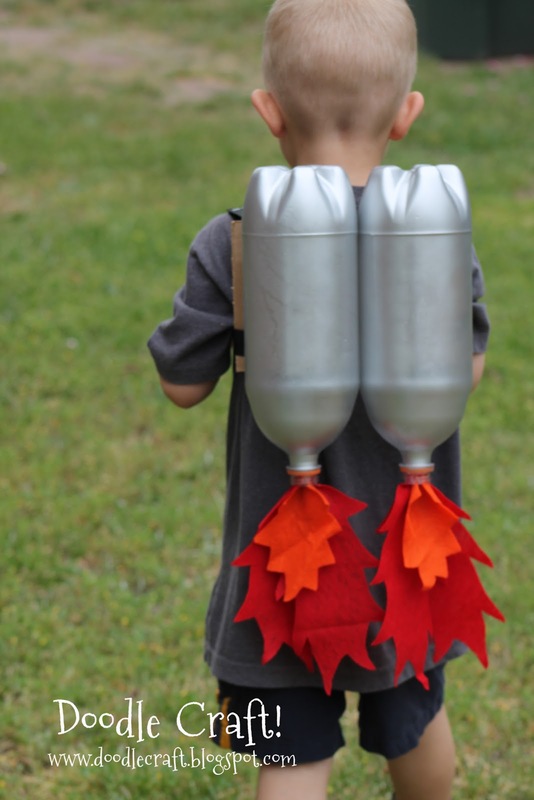 Let your child jet off to an imaginary land where they are a superhuman with a real jetpack. It’s as simple as spray painting two large soda bottles and attaching felt to mimic flames. All forms of marine life are in grave danger due to plastic pollution in the ocean. Teach your kids the importance of preserving our oceans while creating this fish out of plastic. 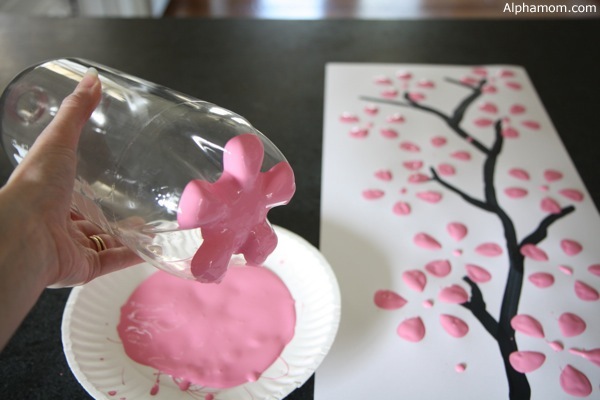 Teach your child the beauty of cherry blossom trees while partaking in this art project, which can later be hung on a wall in your home. 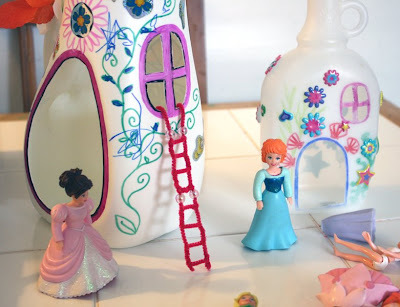 Plastic dollhouses and accessories put a burden on the planet that you can help to reduce by creating these fun dollhouses out of recycled milk jugs. All your child needs is some colorful construction paper and a large milk cartoon to create this colorful turkey, making a great project for Thanksgiving or any time of the year. Everyone loves elephants, but we bet you never realized how easy it is to transform a used milk jug into one! All it takes is a simple snip with scissors paired with your child’s creativity. 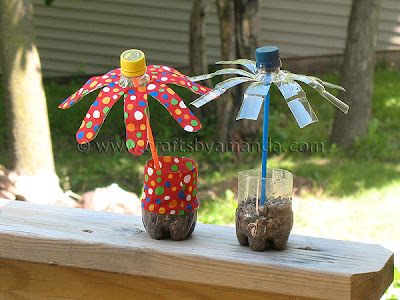 Teach your child the joys of contributing to nature by building one of these chirp-worthy plastic bottle bird feeders. There are other plastic bottle planters on this list, but this one includes a friendly face that younger children in particular will adore. Playing spin the dreidel is a favorite Hanukkah pastime. These twirling tops allow your child to recreate the excitement from scratch. Turn bowling into a creative and eco-friendly endeavor with this hands-on project turned favorite family pastime. 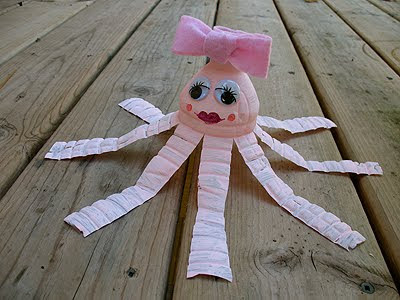 This cute octopus is so cute it’s hard to believe that it is made out of an empty plastic water bottle, but it is! 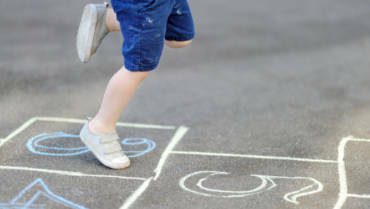 Little kids may need some assistance cutting out shapes, but older children should be able to complete this project with minimal assistance. 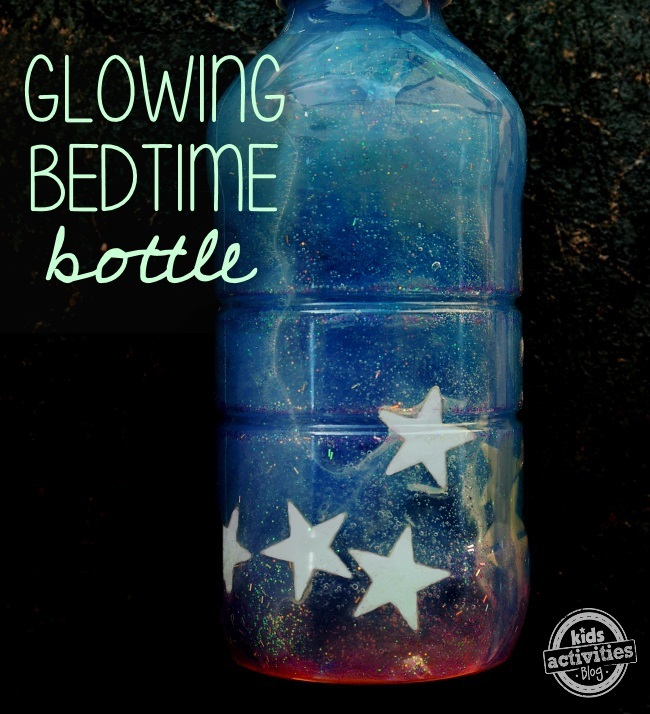 Kids of all ages love to make these neat discovery bottles, and babies love to play with them. 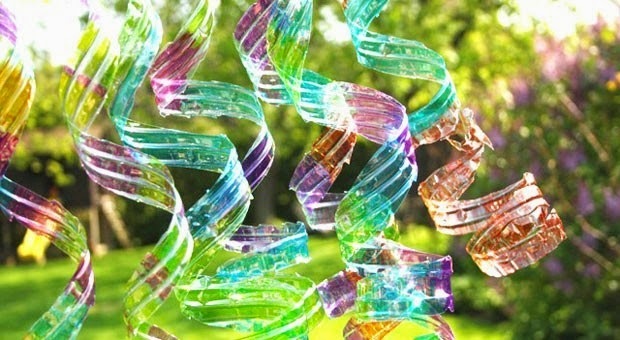 These mesmerizing water bottle wind spirals are easier to make than they look. Your child can make this fun boat using two water bottles, some cardboard and plenty of colorful duct tape. Fill an empty plastic bottle with a bunch of tiny random objects: charms, buttons, erasers, etc. Then add colorful rainbow rice and you’ve got a really fun game of “I Spy”! The following projects are still easy to complete but are considered ‘moderately difficult’ because they require materials that need more hands-on adult assistance, such as a hot glue gun. 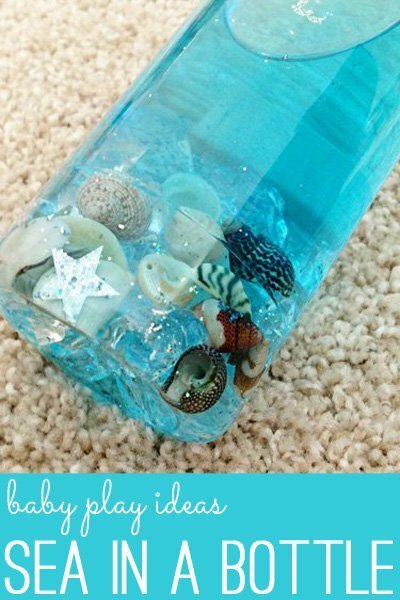 Help your child create this fun jellyfish in a bottle and get ready to be surprised just how real the end results look! Giddy up! We’ve found the most affordable horse in town. This adorable pony is made from a 2-liter soda bottle and a few other materials you likely already have around the house. 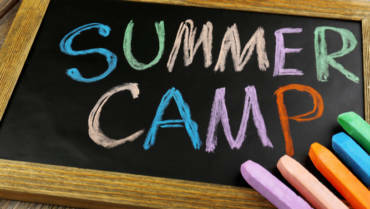 This art project helps your child cool down on a hot day while getting in some physical activity. You start by adding the appropriate holes to the bottle, which is then attached to a regular garden hose. 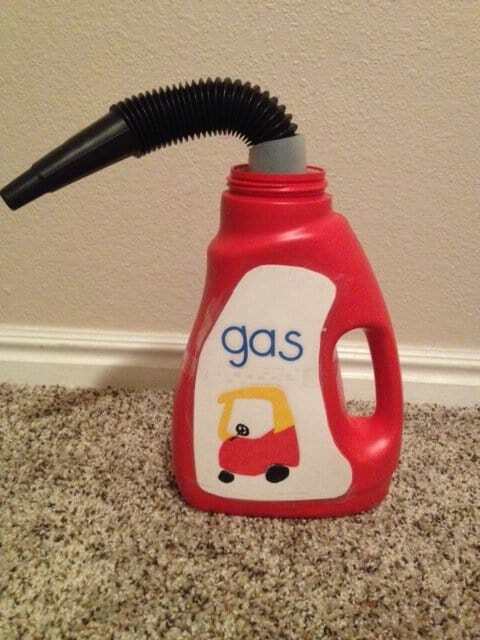 Skip out on the pricey Little Tikes gas pump and make this gas can instead for just a few dollars. All you need is an empty plastic detergent bottle, piece of paper, and a funnel from the dollar store. These adorable apple shaped boxes make the perfect gift for teachers. Plus, the plastic bottles they are made from add an extra special shiny appeal to the end result. You can help your child make this adorable Piggy bottle bank using a few common materials along with the printable cutouts provided in the tutorial below. 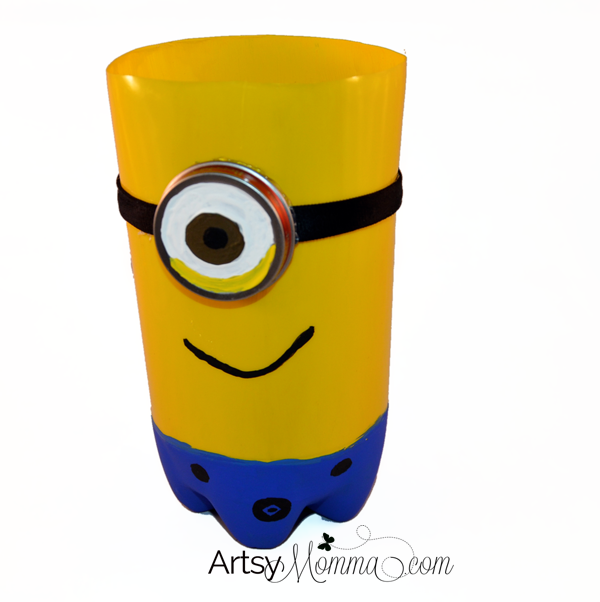 If your kids love the movie Despicable Me they will go crazy for this Minion craft. 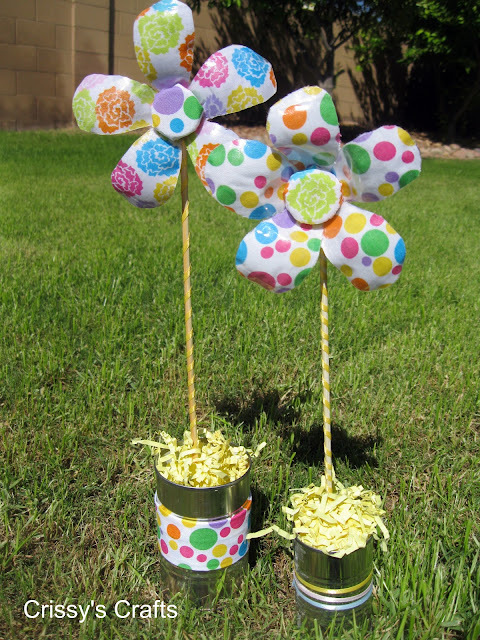 These adorable flowers made from water bottles make a cute addition to your lawn or home, as well as superb party decorations. 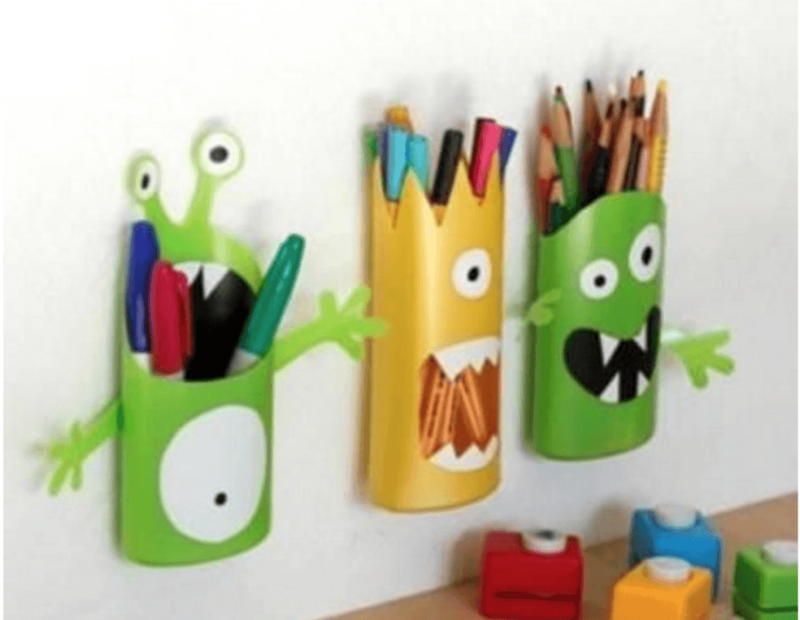 Reuse old plastic shampoo bottles to create these fun pencil holders designed after monsters. The trickiest part is cutting the bottles to match the right shapes. After that’s done this super fun art project isn’t all that scary. Transform an old plastic bottle into a wide-mouth shark, add a little DIY fish attached to a string and you’ve got yourself a fun game that’ll entertain long after the project is complete. Have fun with Paper Mache creating this awesome airplane zip pouch made from a recycled water bottle. Get your child growing plants that sprout delicious veggies. 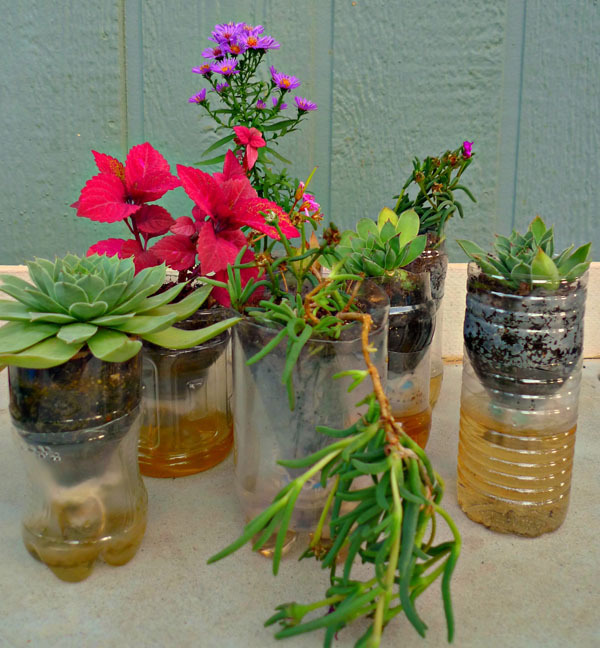 All you need are some water bottles, soil and seeds! Butterflies come in all colors and patterns, allowing children the freedom to get creative decorating their own. 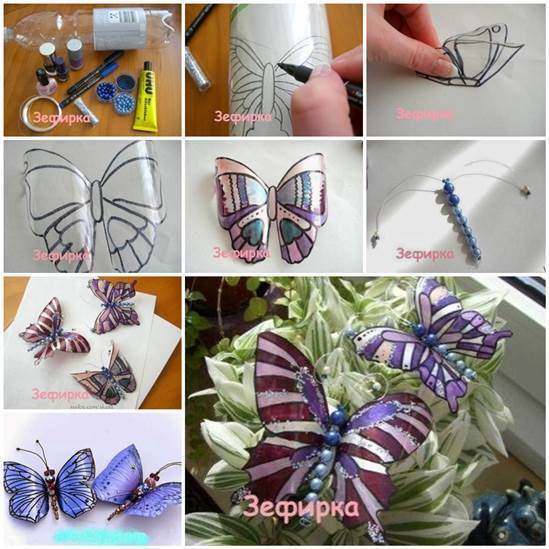 You can use one water bottle to create multiple butterflies. These robots are fun to make with your child and they are a great decoration for a birthday party. The detailed instructions call for other recycled materials as well, such as an old cereal box, plastic lids and candy wrappers. 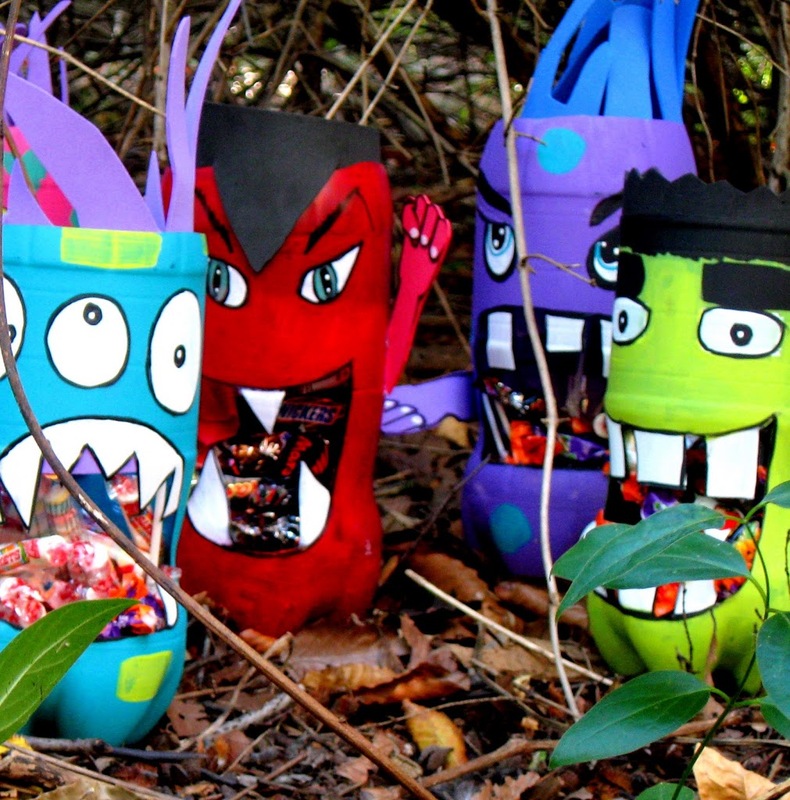 Have your child create a monster of a candy jar that’ll give you a nip if you eat too much candy! Let your child craft a crown to be proud of out of a used plastic bottle. 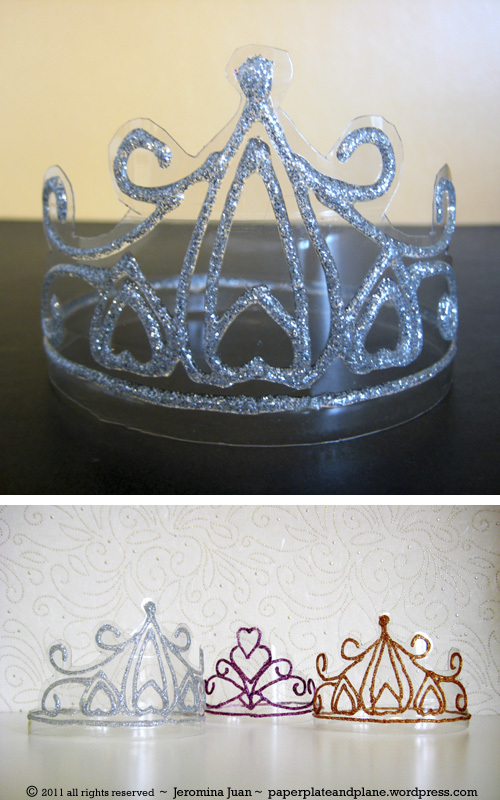 The instructions include a crystal crown template to help your child cut out the crown shape. 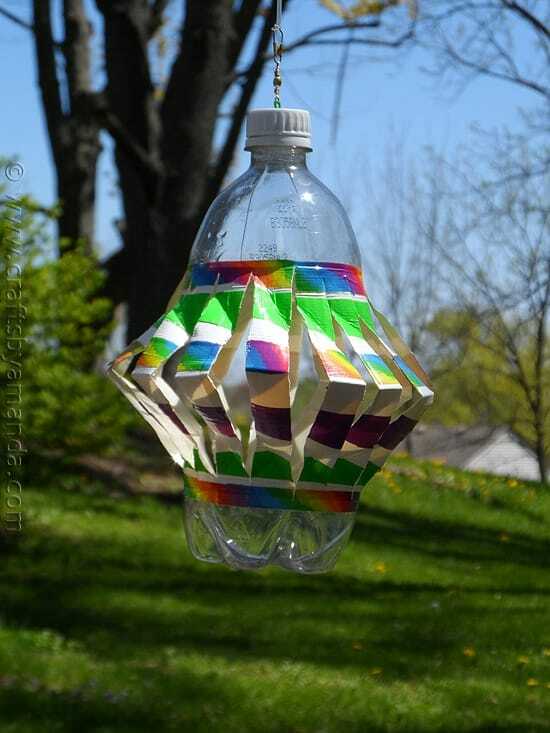 A wind spinner is a classic art project made more fun by the fact it can be made from recycled bottles. The spinner is easy to make but requires a lot of cutting with a knife, which is why it is classified as moderately difficult. 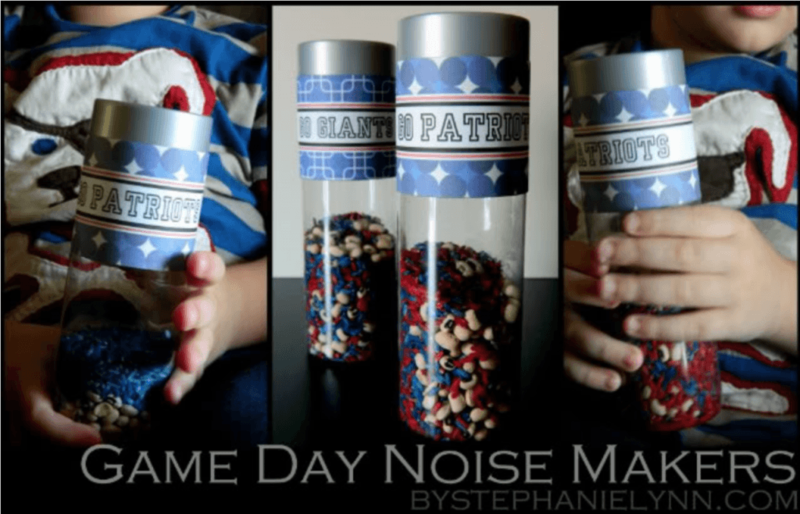 If you’ve got an upcoming event that requires making some noise, this noisemaker is the perfect craft for your child. They will have fun making it and then even more fun using it to cheer at a sporting event, graduation, or wherever else noise is encouraged. 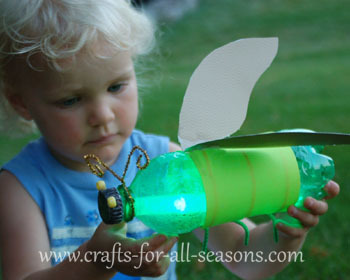 If you’ve got a kid that loves bugs they will have a blast creating and using this ‘Bug Jug’. 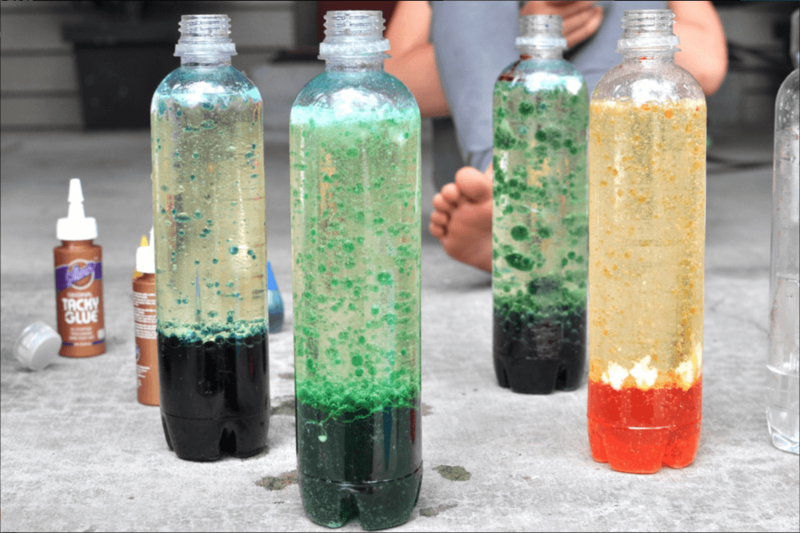 Filling plastic bottles with an assortment of ingredients creates this neat lava lamp. Kids love the art project, which is just as much a science lesson as it is a creative outlet. Don’t be scared off by the word ‘challenging’! These projects are still simple enough to do at home without much crafting experience. They just require more materials and/or hands on assistance from an adult. This project is going to require plenty of help from an adult and includes more complicated materials such as a drill bit, spray paint, heavy wire and needle nose pliers. If you have the time and materials the finished product as well as the overall experience makes it well worth it! 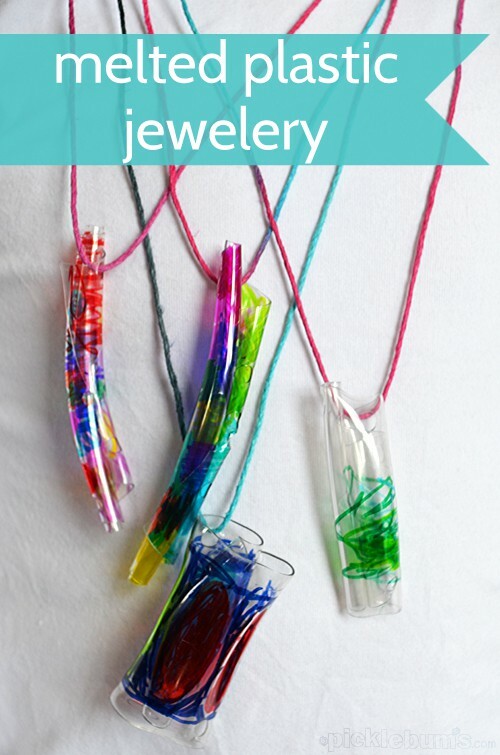 Teach kids how heat affects plastic while creating trendy jewelry made from recycled materials. Add this beautiful mobile to your child’s bedroom or playroom for a fun and creative splash of mesmerizing color. Kids learn about basket weaving in history class at a pretty young age. 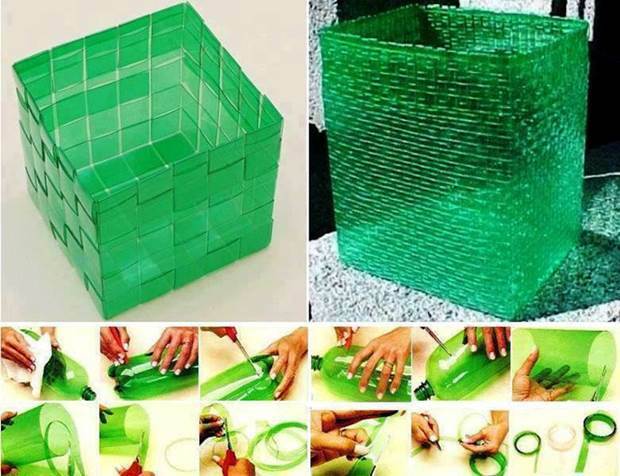 Let your child try out the skill firsthand by helping them weave a basket using only recycled bottles. 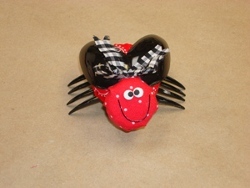 You can put to use a lot of recycled plastic bottles to bring this craft to life. 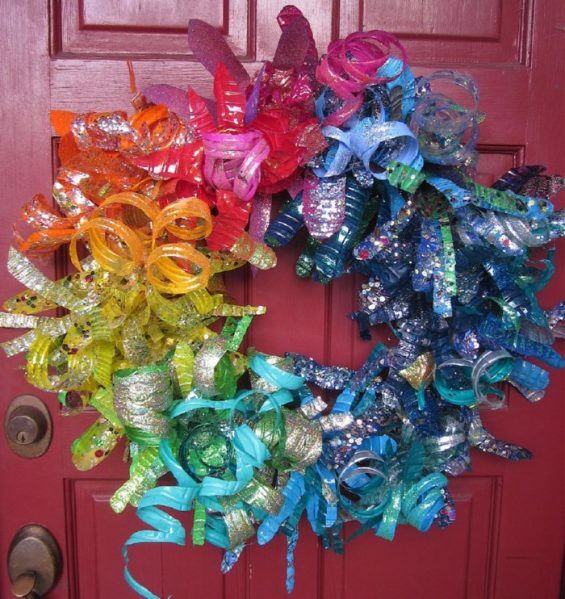 Create different wreaths based on seasons or an upcoming holiday. With some time and patience you can help your child create this rather elegant looking bouquet surprisingly fashioned from plastic bottles. You can use leftover bottle caps and a few other odds and ends to create this fun swing set for dolls. As long as you carefully follow the instructions you can shorten or lengthen this doll’s hair without cutting it, granting your child hours of hair styling fun. Making the doll from two 5-liter plastic water bottles is just as much fun as playing with her. Teach children about Native American history while letting them explore their creative side. This makes a great project for the entire family to partake in. You can use a simple bottle and some other random items to create this haunted Halloween creation. Your child will have a blast creating his or her own ghosts to go inside. 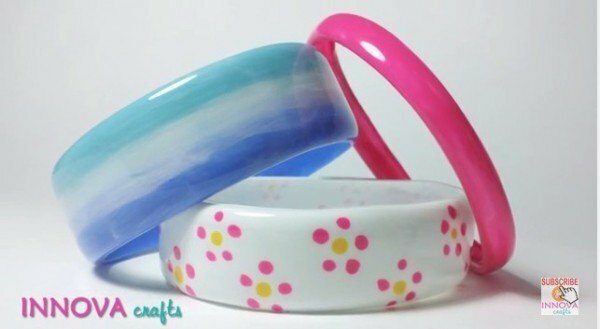 These fashionable bracelets started off as an ordinary plastic water bottle. Creating them requires the use of an iron, so you’ll have to do some of the work for your child. Kids love fireflies and anything else that glows in the dark, hence why this art project is a big hit.